How to run an application on Standalone cluster in Spark? 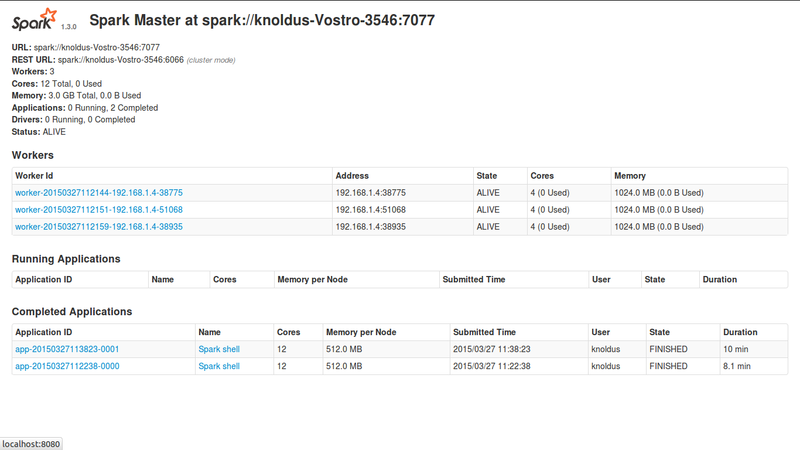 April 14, 2015 April 14, 2015 Scala2 Comments on How to run an application on Standalone cluster in Spark? In this blog, we will run an application on a standalone cluster in spark. 2. Create a package of the application. To run an application on standalone cluster, we need to run a cluster on our standalone machine. for that refer this blog. Your Master and slaves, all should be alive. In my case, i have 3 slave instances with 1024 MB Mamory. First of all we will create a package of the application. the package is a jar file of the application. $ cd <path-of application> //It will take us to the directory of the application. $ sbt package //It will create a package of the application. 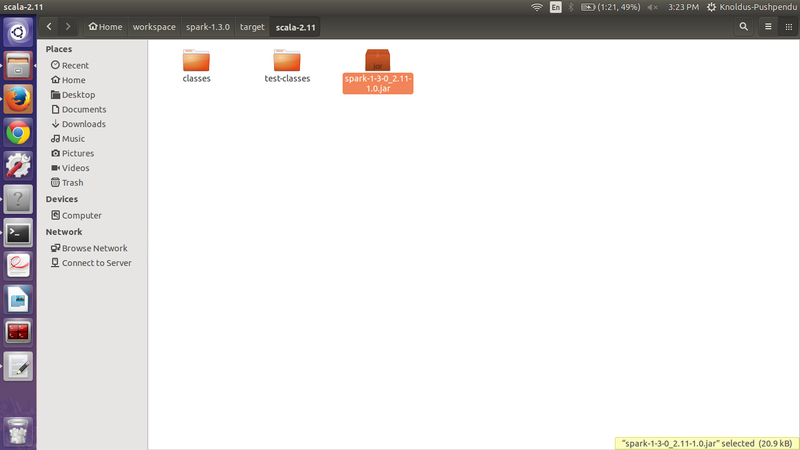 The package will be created in “target/scala-2.11/<application-name>.jar”. It is ready to use. As you can see in the picture. –conf: Arbitrary Spark configuration property in key=value format. For values that contain spaces wrap “key=value” in quotes (as shown). 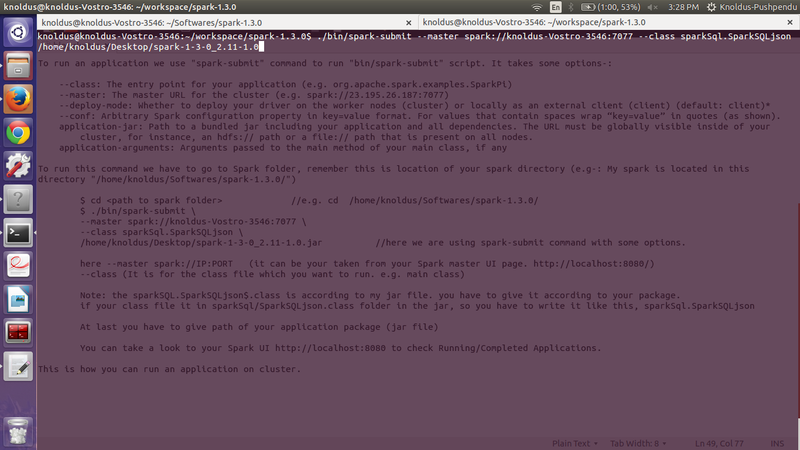 /home/knoldus/Desktop/spark-1-3-0_2.11-1.0.jar //here we are using spark-submit command with some options. 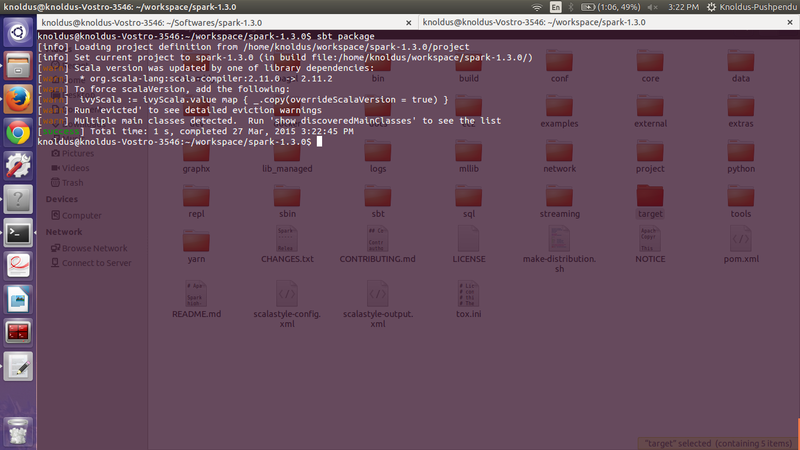 Note: the sparkSQL.SparkSQLjson$.class is according to my jar file. you have to give it according to your package. You can take a look to your Spark UI http://localhost:8080 to check Running/Completed Applications. This is how you can run an application on cluster. Is it possible to run application without spark-submit or spark-shell? I have a scala app, I would like it to connect to spark master, submit job and get results.